15% less fat than our standard adult recipe. Beet pulp a good source of soluble and insoluble dietary fibre important for maintaining normal intestinal transit time and motility. Omega 3 and 6 essential fatty acids and zinc for a healthy skin and coat. Contains vitamins and minerals to maintain health and vitality. UK sourced chicken fat. Glucosamine, chondroitin sulphate, methylsulfonylmethane and omega 3 fatty acids for joint repair and mobility. Formulated without wheat, wheat gluten, beef, pork, dairy and soya. Teeth - crunchy kibble for oral health. 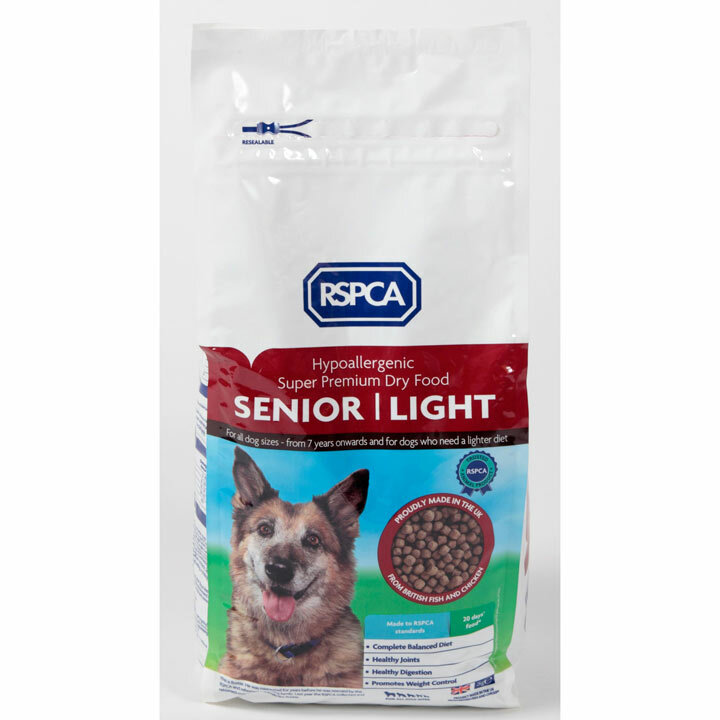 Our RSPCA Senior / Light Dog Food is a super premium, complete food for dogs aged 7 years onwards or dogs who need a lighter diet. For advice on feeding and making changes to your dog's diet click here.